The great Yankee bullpen of the late 1990’s had been disrupted by the departure of right-hander Jeff Nelson after the 2000 season. Brian Cashman had spent the first three weeks of June in 2001 trying to put the finishing touches on a trade with the Expos for Ugueth Urbina but the deal fell apart at the last second. I remember salivating over the possible addition of Ugie when rumors of the proposed deal became public. 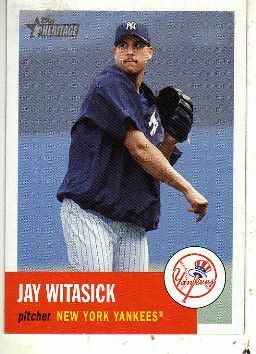 Naturally, I was disappointed when my favorite team ended up with Jay Witasick in their bullpen instead. At the time of his acquisition, Witasick had already been pitching in the big leagues for five seasons with three different teams. He also had never posted an ERA below 5.64 in any of them. But then suddenly, during the first half of the 2001 season, he was getting everybody out for the San Diego Padres. His fastball was suddenly faster, his control sharper and his ERA was a microscopic 1.86. Cashman was willing to ignore Witasick’s half decade of big league history and sent Yankee infield prospect D’Angelo Jimenez to San Diego in exchange for the six-foot-four-inch, right-handed native of Baltimore. The newest Yankee then got shelled in his first appearance against Baltimore but settled down and pitched decent ball for New York through August. Then he got hot during the final month of the 2001 season, turning in ten consecutive appearances without surrendering an earned run, earning him a spot on Joe Torre’s postseason roster. That proved to be a bad decision. He did not pitch well in his only ALDS appearance against Seattle. He pitched even worse in his only ALCS appearance against the Angels and then turned in one of the worst World Series pitching performances in the history of the Yankee franchise. After Andy Pettitte gave up four runs during the first two innings of Game Six against Arizona, Torre replaced him with Witasick in the top of the third with two Diamondbacks on base. Witasick permitted those two runners to score and then proceeded to give up nine more runs of his own, making his World Series ERA 54.00. You know what’s even more remarkable? Naturally, George Steinbrenner had this guy jettisoned from New York after that Series and he ended up back in the World Series the very next season with San Francisco. How did he do? In two appearances for the Giants in that Fall Classic, he retired just one batter and posted a second consecutive World Series ERA of 54.00. Witasick shares his birthday with this Yankee second baseman from the 1920’s, this former Cy Young Award winner, this outfielder known for his sweet swing and this one-time Yankee pitcher who also gave up Bucky Dent’s home run. His Yankee teammates used to call him “Wardie.” He had put on the pinstripes for the first time in 1917, when he was just 20 years-old. A year later, Miller Huggins became Yankee Manager and Ward sat on his bench for two seasons, listening, watching and learning how the game was played. In 1920, the wife of Yankee third baseman, Frank “Home Run” Baker, died suddenly. Baker decided to take a year off from playing baseball to be with his two young children. “Hug” started playing Ward at third that season and the Akansas native did OK, hitting 11 home runs and driving in 54 for an improving Yankee team that also featured newcomer Babe Ruth that year. When Baker decided to return to the game the following year, the Yankees traded their starting second baseman, Del Pratt to the Red Sox and Huggins made Ward the team’s new starting second sacker. For the next three seasons, he was as valuable a Yankee as any with the exception of Ruth. 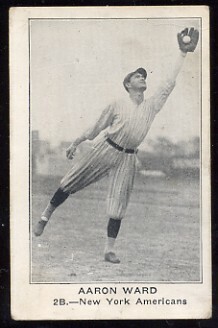 Ward hit a career high .306 in 1921, helping Huggins and New York reach their first World Series, which they lost to their hometown rivals, the Giants. They lost to them again in the ’22 Fall Classic but the third time proved to be the charm the following year and Ward played a huge roll in the Yankees first-ever World Championship. He hit .284 in the regular season and drove in a career-high 82 runs. Than in the ’23 World Series, Wardie led the Yankees with 10 hits and a .417 batting average, while providing excellent defense at second. Yankee owner, Jacob Rupert told the press that Ward deserved as much credit as Ruth and Huggins, for the Yankees’ first title. Neither the Yankees or Ward could continue their success in 1924, as the team finished in second place and the second baseman slumped to .253. The bigger problem facing Huggins was Ruth’s outlandish personal behavior and the impact it was having on not only the Bambino’s play but also the attitude of the entire Yankee team. It came to a head in 1925, the year of Ruth’s famous “big bellyache,” which in actuality was a complete physical and mental breakdown. The Yankees fell all the way to seventh place in the final standings. The Bambino had been scared straight. He worked harder during the 1925 off season than he ever had before and helped the Yankees win another AL Pennant in ’26. But he sure didn’t do it by himself. New York had introduced a whole new right side of their infield that year. Lou Gehrig took over for Wally Pipp at first and Aaron Ward lost his job at second to a kid named Tony Lazzeri. He appeared in just 22 games during his final season in the Bronx and then got traded to the White Sox. He retired two seasons later with a .268 lifetime average and 966 hits during his dozen-year big league career. Wardie shares his birthday with this former Cy Young Award winner, this outfielder known for his sweet swing, this one-time Yankee pitcher who also gave up Bucky Dent’s home run and this former Yankee reliever. 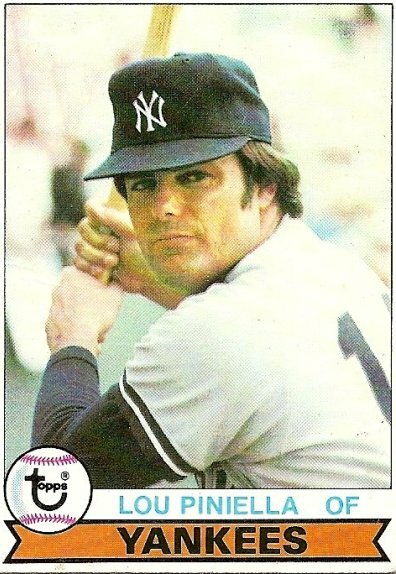 If you’re old enough to remember when Lou Piniella played for the Yankees, you most likely enjoyed watching him do so. He had very little speed and not much power so he mixed every ounce of talent he had with every bit of effort he could muster to play a huge role in helping New York win five pennants and two World Series during his eleven seasons with the team. Oh yeah, he also had a beautiful swing which earned him the nickname “Sweet Lou.” He first donned the pinstripes in 1974, when the Yankees picked up the 1969 AL Rookie of the Year winner from the Royals in a trade for veteran reliever Lindy McDaniel. It turned out to be one of the best transactions in Yankee history. He hit .305 as manager Bill Virdon’s everyday right-fielder during his first year in the Bronx but then he went through a horrible season in 1975, averaging just .186 and helping to get Virdon fired and replaced by the fiery Billy Martin. Billy began playing Piniella a little bit in right field, a little bit in left and a little bit at DH. Lou simply thrived in this semi-utility role, averaging over .300 for the rest of his Yankee career. The play he will always be remembered for in the Big Apple was his famous feint on the Jerry Remy liner that he lost in the sun during the 1978 playoff game against the Red Sox. If he doesn’t make believe he sees that ball, Rick Burleson, who was on first at the time, easily gets to third and might have scored. Then Lou spears the ball on one hop and again prevents Burleson from getting past second. George Steinbrenner loved players born in his adopted home-town of Tampa and Lou was the first native of that city to play for The Boss. That helps explain why George gave Lou his first manager and general manager jobs with the Yankees. Piniella’s temper and Steinbrenner’s famous impatience with anyone placed in either of those positions ended any chance Lou might have had to retire from baseball as a Yankee. Instead he went on to win three Manager of the Year titles, the 1991 World Series and finally ended his 43-year big league career this month when he walked away from the Wrigley Field dugout to spend time with his ailing Mom and go fishing. Lou turns 68 years-old today. The guy who gave up the home run to Bucky Dent in that 1978 playoff game, the pitcher who started that playoff game for New York, this former Yankee second baseman and this former Yankee reliever were all also born on August 28th. I met Ron Guidry once. It was back in the early eighties when the Yankees were still doing their spring training at Ft Lauderdale. My wife and I and our two children were visiting my in-laws in nearby Boynton Beach and we got tickets to New York’s last home exhibition game of that season. My son Matt had not been feeling well at the time so during the game, I was carrying him down the ramp from the stands on my shoulders, to get him out of the hot sun for a while and get him something to drink. That was when we saw “the Gator.” The ramp was right alongside the Yankee clubhouse exit, separated by a chain link fence. Since this was their last game in Florida, the Yankees were all packed for the plane ride north and there was a huge pile of luggage sitting behind the fence. 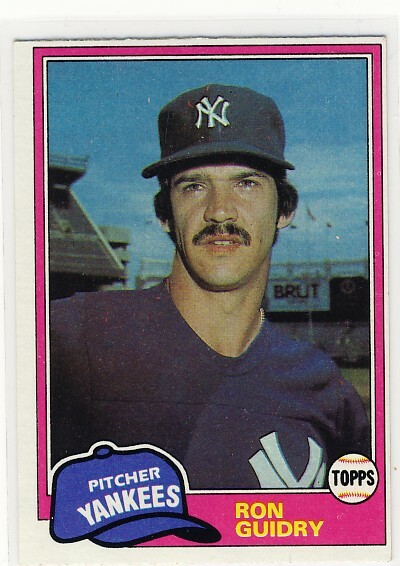 Ron Guidry, was rummaging around inside one of the suitcases. I shouted out a greeting and he looked up, smiled and gave a friendly wave. Then he saw Matt on my shoulders and asked me how old he was. I think he was three at the time. Guidry came over to the fence and stuck his finger through one of the links and touched Matt’s hand with it. I told him how my son had not been feeling well and Guidry remarked that he looked sort of flushed and it was a good thing I was getting him into the shade. The very best pitcher in baseball at the time then told my young son that he hoped Matt felt better real soon. Then last year I saw a report on some television show about how Guidry would serve as Yogi Berra’s personal companion at the Yankees’ annual spring training. Gator would pick the aging Hall of Famer up at the airport when he arrived in Tampa, get him checked into his hotel, take him to and from Legends Field every day and have dinner with him most every night. A few days after the report aired, Berra took a tumble in the Legends Field clubhouse and it was Guidry who went with him to the hospital. Guidry was born on August 28,1950 in Lafayette, LA. If you had the privilege of seeing him pitch you remember how dominating he could be on the mound. He won twice as many games as he lost during his career, 170 in all and he always got the ball whenever the Yankees were facing a must-win. He was a great Yankee. And if you didn’t know it already, now you know that Ron Guidry is a super nice human being as well. Happy 61st birthday Gator. Guidry shares his August 28th birthday with; the pitcher he beat in that famous 1978 playoff game against the Red Sox; the Yankee right fielder in that same game who made a great play to save Gator’s victory that day; the starting second baseman on the Yankees’ first World championship team and this former Yankee reliever.